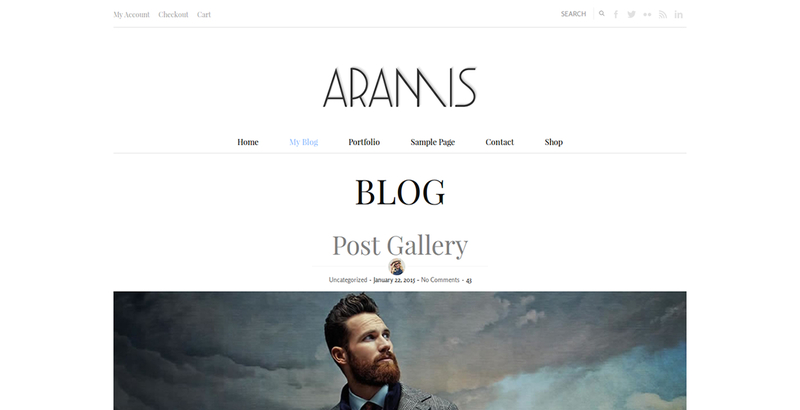 The Aramis is an elegant, simple yet stylish WordPress theme that suits your blog, personal website or online shop. 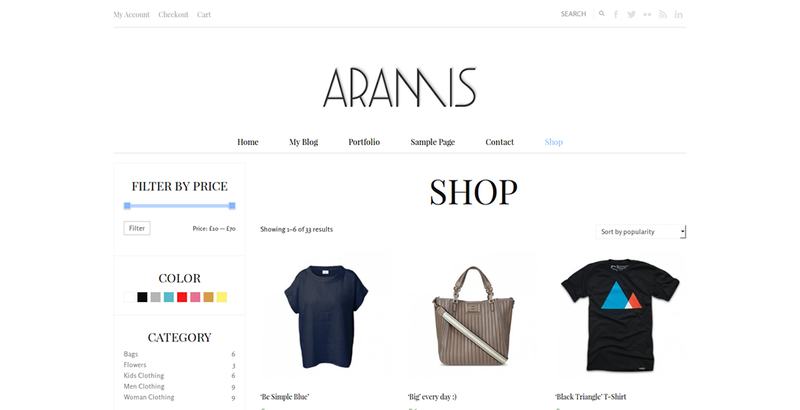 Built as multi-purpose WordPress theme Aramis supports eCommerce plugin for WordPress (WooCommerce) allowing you to build beautiful, elegant website in no time. The theme has plenty of useful options that let you customize it to your needs, make your website truly yours. Responsive design – theme has been optimized for mobile devices, smartphones, tablets, laptops and desktops. 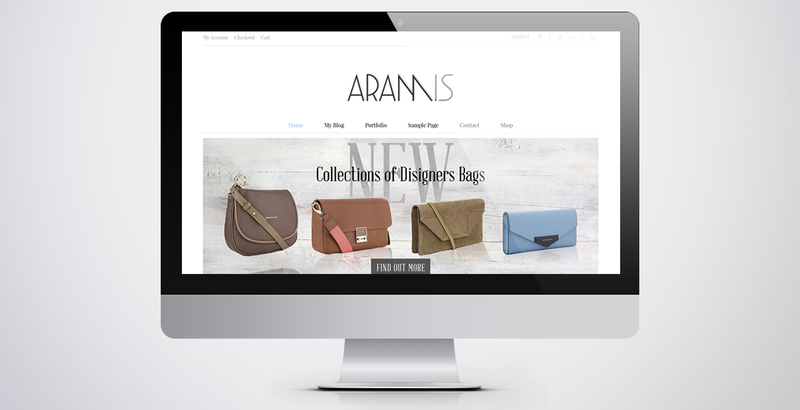 eCommerce Support – our main goal was to be develop WordPress theme that will let you build an elegant, clean and effective online shop quickly and efficiently. We removed all the clutter and all the fancy features. WooCommerce compatible. 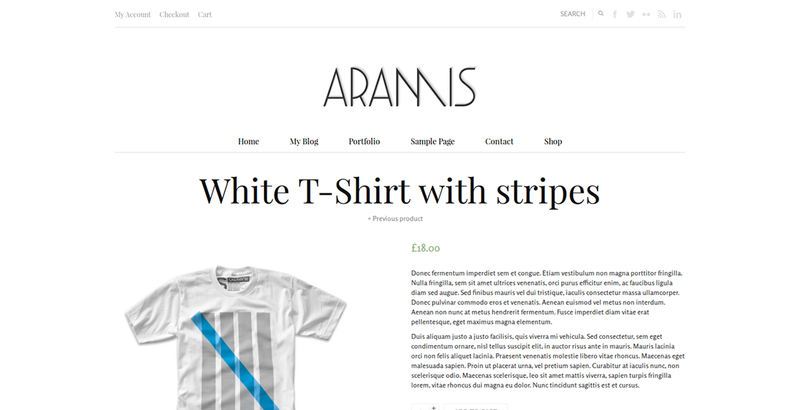 Content Orientated – while designing Aramis WP theme we focused on usability, user experience and putting the content first. This way your pages, products will take over user attention. Content is the king gets real meaning here. 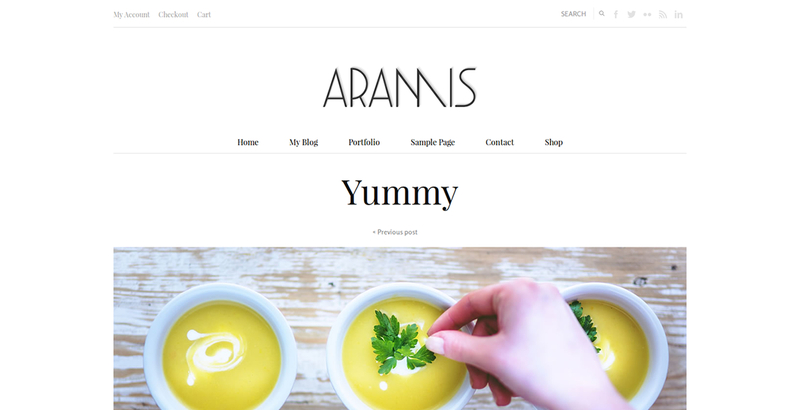 WordPress Theme for Blog or Website? What about blog you can ask? 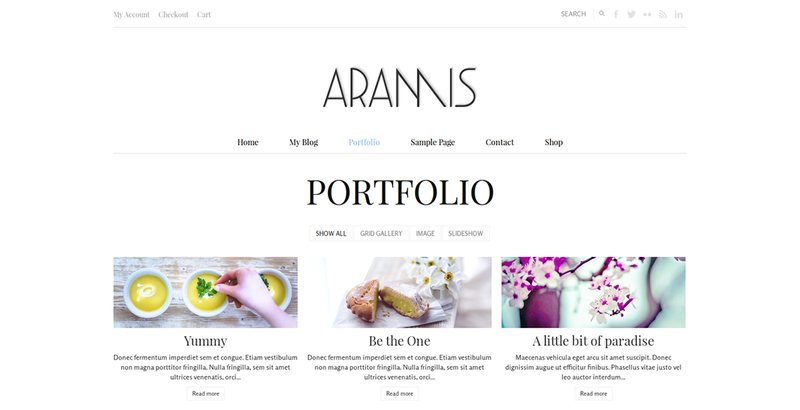 Can I build regular yet unique website using Aramis? The answer is ‘yes’. Powerful yet intuitive Theme Options panel – this is your commanding centre where you can set many features such as layouts, sharing options, blog options, gallery features, likes and dislikes, what to show or what to hide, set fonts or colors, change backgrounds, uploads logos and so on. Everything is organized in simple way. 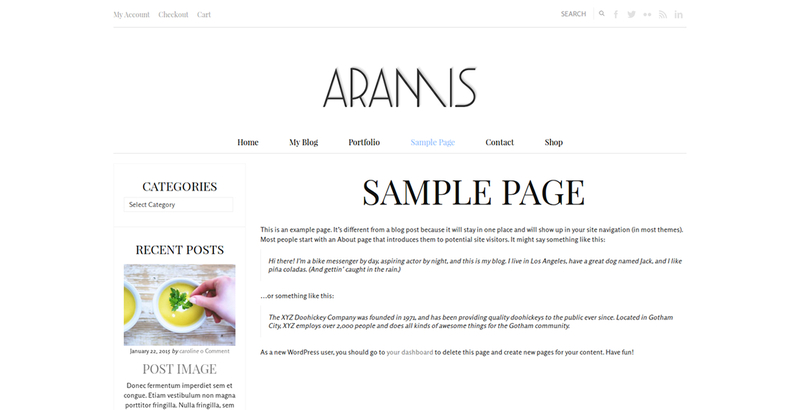 Social Media – Social media are equally important these days to SEO or traditional PR & marketing, so we made sure the Aramis theme allows you easy connect to your social networks profiles, display images from Instagram or show galleries from Pinterest. Do not forget about Facebook integration. Of course there are built in sharing options that may be displayed at the end of each post. Custom Fonts – Forget about painful custom fonts integration. Although our theme supports custom fonts, the Google Fonts are includes so you can change fonts for your navigation, headers, body text, logo (if text) with few clicks. You stay in control of size or color of text elements. As mentioned above there are plenty of shortcodes available for you in your editor that come with the theme. You can build columns, rows, add price lists, sliders, carousels, buttons and more just with few clicks. 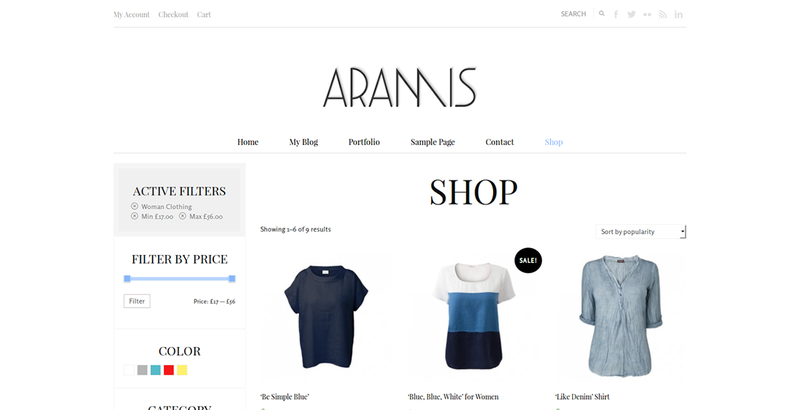 To sum up the Aramis WordPress theme is a versatile tool that can help you build amazing website or advanced but still user friendly online shop. This is what we call multi-purpose.